Heard this on the radio the other day on my way to work. Does it explain, at least in part, the popularity of Elecraft products? In other news, the blog has been silent for a while, but that doesn’t mean things haven’t been happening. I have a couple of challenging projects that have been taking up the usual blogging time. Stay tuned! I recently had the good fortune (Sarah and some Alaskan friends might question the use of the adjective “good”) to spend about 10 days on the Aleutian island of Adak for work. In the midst of preparing for the trip, I learned that my fellow travelers Kevin, KJ4OAP, and Nathaniel, W2NAF, were planning to bring ham gear. Of course, I was as well, so we ended up with quite the merry bunch of hams on Adak. I don’t collect IOTAs, but I know it’s popular. So, I checked out Adak Island in the IOTA directory—NA-039, Andreanof Group. Fewer than 20% had claimed it, so it’s not super-rare, but not super-common, either. I was assured by at least one friend that we would be very popular, especially in Europe. One of the first things you notice about Adak when you get off the plane is the wind. 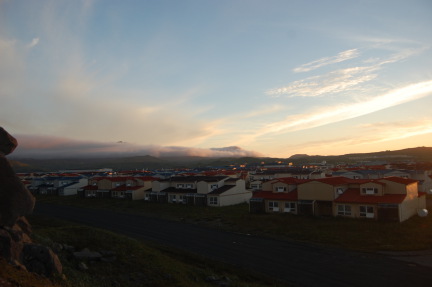 In fact, the locals call Adak “the Birthplace of the Wind.” It’s actually quite poetic considering that the winds are so strong that you don’t leave furniture outside and that the houses shudder with typical gusts. I experienced 75-mph gusts and 60-mph sustained winds during my short visit alone. 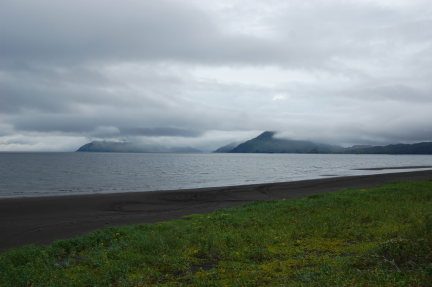 Adak is probably best known as the forward base from which the U.S. conducted its counteroffensive against the Japanese invasion of Attu and Siska during World War II. It also played an important role during the Cold War and although the military left some 10 years ago, it retains much of the infrastructure including heavy machinery, a port, and a large airport. The population shrank rapidly from a peak of just over 6000 in the 1990s to around 150 today. Just before the military (principally Navy) pulled out, they were in the process of building new base housing. The housing was completed nevertheless and so there are literally dozens if not a hundred homes that have never been occupied! Some of the others have been converted into a small hotel (this is where we stayed). The economy is heavily dependent on fishing and fish canning right now. However, the locals are excited about the possibility of becoming a logistics hub for oil and gas work in the Bering Sea. In fact, the aircraft I came out on (An Alaska Airlines 737-400) had an unprecedented 60+ passengers on it because executives from an oil company were coming to check the place out. Alaska Airlines operates “regular” flights twice per week. Due to a fiction of time zones, Adak is only one hour behind Anchorage, despite being some 27 degrees west. So, sunrise and sunset are both very late in local time. It is also very far south, about the same latitude as Vancouver. Although I arrived at 6:30 pm, it was still light out for almost another four hours. So, I quickly put up the vertical on 20 meters just before sunset. While we were putting up the vertical, Nathaniel met Jeff, KL2HD, who happened to have flown in on the same flight as us and who also happened to have his office and station across the street from my apartment. Neat. He works for U.S. Fish and Wildlife Service and they have field sites throughout the Aleutians. 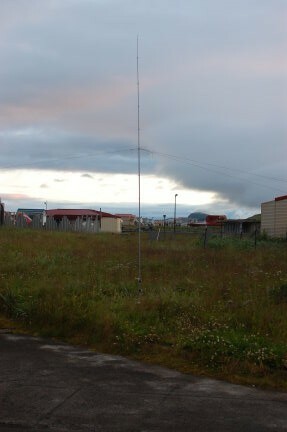 They use HF to communicate with their camps. 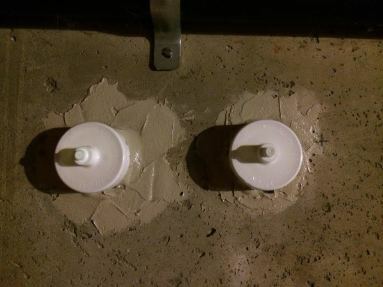 So, he just plugs into a well-installed folded dipole to do his hamming. Have you ever seen a folded dipole installed between two (yes, two) Rohn 45 towers? Intense. Wind. Due to our work schedule (8-10 hours per day plus meals), I often did not manage to get on until 0500 UT at the earliest, and sometimes even later. But, when I did, I was greeted with a roaring pileup of the “deserving.” This elicited a little bit of mail from my East Coast friends about getting on the air earlier. It turns out, however, that for most of the trip, 20 and 17 meters were open to the entire U.S. until 0630 UT. Both the skimmers and the QSOs bear this out. Why yes, I did get a new radio to replace the FT-840. More on this in the future. It was pretty apparent that I had a lot of callers who couldn’t (for a variety of reasons) copy me. European friends reported a total lidfest on their end the first night I was on the air, although I learned a lot about pileup control on this trip. I have great respect for the “real” DXpeditioners who do this from the rarest locations. This was tremendous fun, though, and I enjoyed working each and every one. Thank you for calling! 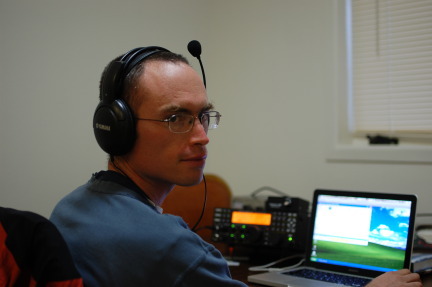 There was one night on 17 meters that I CQed dead air for almost a half hour, making just two QSOs with stateside stations. And like a switch, the Europeans came in over the pole. It was incredible: I made 300 QSOs in 2.5 hours that night…mostly Europeans and Japanese. 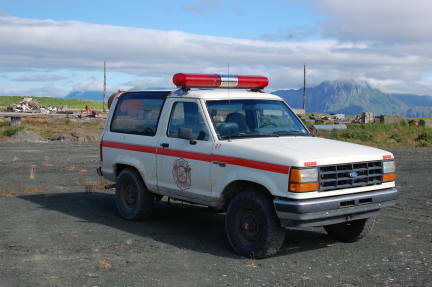 Oh, one more photo…this is one of our rental vehicles on Adak. No, your ARES group cannot buy it. The siren and lights don’t work anyway. So, I got home on Monday and Sarah is amused by the amount of fan mail (QSL cards) the trip generated. Speaking of QSLing, the log has been uploaded to LoTW and has already generated about a 25% return rate. If you worked KL7/K8GU, you can get a nice photo card by sending an SASE or SAE+green stamp to my callbook address. I also use the bureau. To this point, Kevin and Nathaniel and I have been planning to share a card. They are still there for another week (so, if you missed me, you still have a chance for NA-039) and then we will figure out a card and order them. So, it will be a few weeks until cards can go out.